What international evidence exists for adverse impacts from illegal immigration or amnesties for immigrants? In the US, California is every restrictionist’s (and fair-minded skeptic’s) example of how badly things can go wrong if you mismanage immigration policy. I have not yet seen someone cite country-level evidence of poor immigration policy’s impacts: given that Italy and Spain have given multiple amnesties to unauthorised immigrants over the last 3 decades, and the current state of their economies, this seems surprising. Does anyone know of a comprehensive analysis that looks at jurisdictions outside the US? To be clear, I often see specific references to how life in California is now terrible because of illegal immigration. Commonly-cited examples are the problem of the state government’s debt, a dysfunctional state government, soaring crime rates, deteriorating levels of social trust, a collapsing public school system, the high level of unemployment…I could continue on. I often see references made to California as the ultimate end-state for any jurisdiction that permits a large amount of illegal immigration, and would like to understand if this conclusion has been validated or supported by analyses that look at other jurisdictions with large amounts of illegal immigration. A previous post considered this question in the context of comparisons between the US states, but for this post, I’m interested in international comparisons. I’m fine with somewhat unsophisticated stabs at this analysis: breadth can be just as important as depth, and given the rather poor state of knowledge about the ultimate impacts of high levels of immigration, any research or analysis can prove valuable. 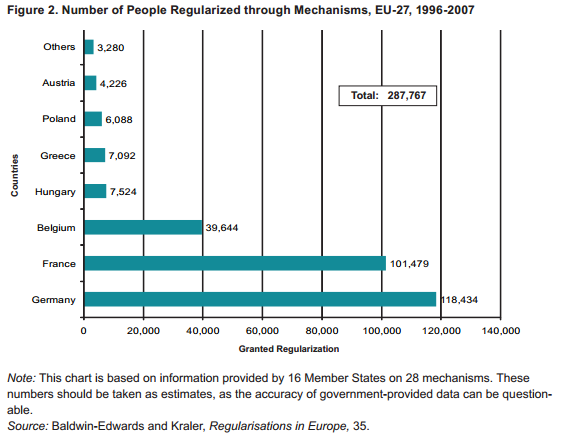 My understanding is that France and Germany both have ongoing processes for unauthorised immigrants to regularise their status, and considering the widespread use of discrete amnesties in other European countries’ immigration policies, it would be interesting to see if there are any different impacts, and what people’s thoughts are on the impact of either option has been relative to a counterfactual where these European countries did not regularise any unauthorised immigrants whatsoever. The US has only implemented one amnesty of note, in 1986. 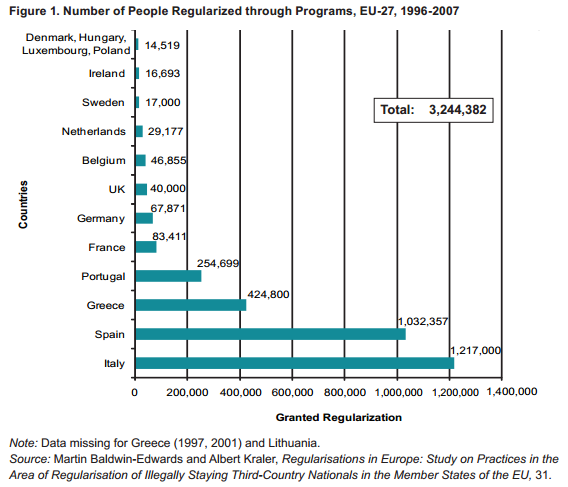 In Europe, amnesties are much more common. Poland for example announced in 2011 its third amnesty since 2003 (though to be fair, Poland has much fewer unauthorised immigrants than the US). Surely there has been some study of the impacts of these amnesties, or even some informal comparison that correlates the number of unauthorised immigrants to various socioeconomic indicators at the country level. And I’m only really somewhat aware of amnesty policies in Europe: I’m not even sure what arrangements, if any, exist in other continents. A quick glance suggests that some of the worse-performing Eurozone economies have been much likelier to offer larger-scale regularisations. However I’m not sure what to make of Germany and France coming in right behind four of the PIIGS on this scale, or of Germany and France topping the list when it comes to mechanism-based (i.e. ongoing) regularisations. Moreover within the PIIGS it also seems quite clear that Italy and Spain are performing better than Greece (I am not sure where Portugal stands). So the correlation, if there is one, does not appear to be that strong. If anyone knows of material that might be pertinent to the issues I’ve raised here, I would love to hear about it in the comments of this post. We can compile a compendium and document it on an Open Borders page about illegal immigration, and/or the regularisation of unauthorised immigrants. This compendium would be a useful reference for future discussions and blog posts on this site. What international evidence exists for adverse impacts from illegal immigration or amnesties for immigrants? is licensed by John Lee under a Creative Commons Attribution 3.0 Unported License.